Roman copper alloy nummus of Valens dating to AD 364-378 (Reece Period 19). 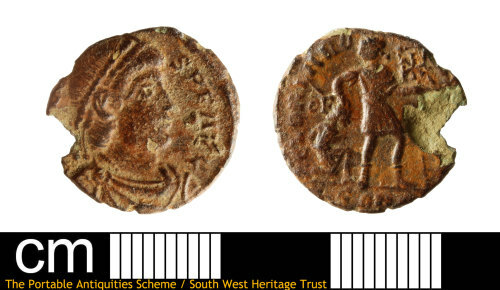 GLORIA ROMANORUM reverse type, depicting the Emperor advancing right dragging a captive and holding a standard. Mint of Arles. Reverse description: Emperor advancing right looking backwards and dragging a captive with his right hand and holding a standard in his left.